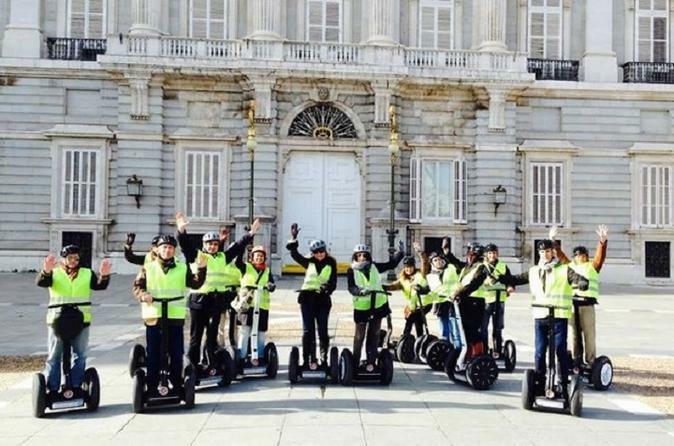 Explore the heart of Madrid by eco-friendly Segway on a fun 1-hour tour of the medieval center. Pass notable sights, such as the Royal Palace, Almudena Cathedral, and Plaza Mayor, all from the safety and comfort of a self-balancing, 2-wheel vehicle. Climb aboard an eco-friendly, self-balancing Segway for a short but comprehensive tour of Madrid’s historic heart, and discover many of its main monuments that date from the Middle Ages and modern age. Meet your guide in Plaza San Miguel for a brief training session. Then, cruise over to the Royal Palace, the official residence of the Spanish Royal Family. Admire its baroque façade, before continuing to Almudena Cathedral with its Gothic revival design. Continue visiting "La Plaza de la Villa" the oldest square in the city with a medieval flavor and buildings from different centuries. Enjoy the way to the Royal Palace seeing "La Plaza de Ramales" and "La Plaza de Oriente". During the tour you will see a lot of interesting monuments and other amazing nooks of the historical center.